How to choose the Rubik's cube to buy ? If you are currently looking to buy a Rubik's cube, you are at the right place. Whether you are a complete beginner who is looking for an introduction to speedcubing, an expert who wants the most current tips, or searching for a universal gift, this page can help. You will find the latest comparisons and feedback of a ra nge of Rubik's cube, from the traditional, classic style to more abstract and unique. Below we have analysed and reviewed the top 5 Rubik's cube currently on the market. As I explained in the page presenting the qualities to look for in a 3x3 Rubik's cube, the definition of the best 3x3 Rubik's cube depends on many different factors. This definition can also differ depending on the person solving the Rubik's cube. Therefore, I am going to give you all the necessary information so that you can make a wise choice, and buy the best Rubik's cube for you. Below you will find an in depth analysis of a range of cubes including the cubes from the brand Rubik, legitimately called Rubik's cubes. But also, some cubes specially built for speedcubing and for beating world records. Most of these cubes are built either in China or in the United States of America. The Rubik's cubes 3x3 are specific for speedcubing and are all made of small cubies (each individual cube) that have been designed in order to facilitate rotations and increase speed. Most of them do not lock up or pop while solving. They also rotate very well from the beginning, even without lubricant for Rubik's cube. Whilst there are a range of Rubik's cubes on sale, it is MoYu, which is regarded as one of the best Rubik's cubes currently on the market. 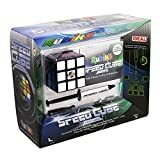 2 How to choose the Rubik's cube to buy ? 5 N°3. Buying the Dayan Zhanchi: white cube ou stickerless ? Let's start with the official 3x3 Rubik's cube from the Rubik's brand. This authentic Rubik's cube 3x3 is a perfect gift for a beginner. It is sold with its booklet of explanations and a detailed method on ho w to solve the Rubik's cube. I have to admit that I prefer the method that I have described on this website, rather than the one provided by the Rubik's brand. I have bought more than a hundred Rubik's cube along my career and have never been disappointed. This cube is classic cube, which is slightly noisy when turning and will become more loose and easier to turn over time. Sometimes, the authentic Rubik's cube is initially slightly hard to take out of the packaging. But, most of the time, this proves a good quality in the long run. It shows that the screws are held tightly and therefore the 3x3 cube will last for a while. If it is too tight out of the box, feel free to add some lubricant into it. The packaging in which it is sold is a quite good quality overall. When purchasing an authentic Rubik's cube; both online and retail channels have the same packaging. The cheapest Rubik's cube online is available on Amazon; and with free delivery, it is more convenient than purchasing in store. Achieve world record solving speeds with this pro spec cube. Includes custom spring and tension adjustments along with performance lubricant, for a smoother turning action. The Official Pro Kit for speedcubing from Rubik brand has everything needed to start speedcubing. The pro kit is a more advanced Rubik's cube set, designed for those already familiar with the basics of cube solving. It is the perfect for a gift to someone that already knows how to solve the Rubik's cube and looking to expand their speedcubing knowledge. The cube is similar to the 3x3 cube that we described earlier, except that the screws can be adjustable thanks to the screwdriver provided in the kit. Essentially, the cube is fully custo mizable for the user, with the tightness of the screws being easily adjustable. The kit also contains a tube of lubricant, perfect for Rubik's cubes. It is easy to set this Rubik's cube so that it is personalised for your own use after a couple of minutes. The adjustable tightness of the cube also ensures the longevity of the cube, as after prolonged use, it may become too loose and need to be tightened. The only drawback to the Pro Kit from Rubik's brand is its price. It is slightly more expensive than the usual Rubik's cube and that chinese speed cubes, however is best for those wanting to buy a cube that will provide extensive use. Despite the price, the official Rubik's cubes often last longer than the Chinese Rubik's cube that are discussed below. N°3. Buying the Dayan Zhanchi: white cube ou stickerless ? It has to be said that the 3x3 Dayan Zhanchi is one of the top 5 of the best Rubik's cubes on the market. The Dayan Zhanchi is the first 3x3 speed cube from China and has been in the market for approximately 5 years ago. It was designed as the cube perfect for speedcubing. Designed with the help of the Chinese World Champion of Blindfolded Rubik's cube, the internal mechanisms have been uniquely created so that it would be the fastest possible, whilst producing the least number of pops (when one of the cubies pop out of pla ce.) The mechanism is really inventive and the result is amazing. If you are looking for the best speed cube, have a look at our guide. If you decide to start speedcubing, or if you now cube for a while, this Dayan Zhanchi is an excellent cube. The screws under the center pieces can also be easily adjustable, like the Pro Kit by Rubik's brand. Some of the Dayan Zhanchi models have stickers - mainly the white and the black version, whilst others are painted and have no stickers. There is no difference in terms of speed so the choice will be done purely based on style and taste. Some speedcubers prefer painted cubes, other prefer cubes with stickers, which is purely down to personal preference. Painted stickerless cubes were introduced following the success of the classic stickered cube, as an alternative. 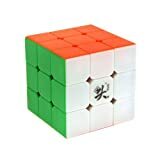 Essentially, the Dayan Zhanchi is a great cube for speedcubers looking to buy a very fast 3x3 cube which strays away from the traditional Rubik's brand. It may look like its older brother the Dayan Zanchi, but the Dayan Guhong is a big name in the speedcubing world. Most of the champions use this cube and most of the world records have been made with the Dayan Guhong. The 3x3 Dayan Guhong is definitely one of my favourites. The feeling of this 3x3 cube is amazing : turning is easy, smooth. No lock-up, no pops both during practice and competition. It is also very discrete, as most Rubik's cubes are quite noisy. In comparison to other cubes, this one is virtually silent. Unfortunately for me, when I started speedcubing, such a 3x3 cube did not exist. On top of this, the Dayan Guhong is the best Rubik's cube on sale. Its price is very attractive, being undoubtably the best cheap Rubik's cube, with a price point of less than $10. For people that do not want to spend too much, I suggest that you buy this Rubik's cube. The MoYu Aolong that we consider as the best is also an excellent cube but slightly more expensive. If price is your only criteria, get the Dayan Guhong, best Rubik's cube under 10 dollars and excellent quality. I was a big fan of the Dayan Guhong until I discovered this MoYu Aolong v2, which is the excellent 3x3 cube from the Chinese brand MoYu. First of all, it has all the qualities that we could expect when searching for the perfect Rubik's cube; easy functioning, smooth, speed and precision. This cube is by far the best on the market; and is available on Amazon; which offers free delivery and is compatible with Amazon prime. I am not the only speedcuber to consider it 5 stars, as the review on Amazon highly regards this cube as outstanding. Its price is slightly above the Chinese-made Dayans but is still very reasonable for a Rubik's cube of this quality. Buying an official 3x3 Rubik's cube can often be more expensive and very disappointing in comparison with this MoYu Aolong v2. If it Rubik's cube on the planet that you are after, paying a few extra dollars will be made up for once using this cube. Out of the box (very nice box, by the way), it is immediately very smooth to turn. It is a real pleasure to use it. After more than a thousand solves and the use of a Rubik's cube lubricant (which is unfortunately not included), it is still very smooth. The 3x3 cube is also very fast, which allows it to beat world records. The center pieces are easily unpluggable. It allows the speedcuber to precisely set the tension of the center screws. All these facts make the MoYu Aolong v2 ideal for the practice and the competition. This cube is stickered; with the colors on the stickers being easy to differentiate, though not too bright. More important, they do not peel off or look worn after a few solves. This 3x3 cube quickly became my favourite. If you want to buy the best Rubik's cube 3x3, the MoYu is a very serious candidate. So... Which Rubik's cube 3x3 is your favourite ?